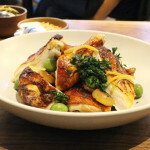 It was a double treat for me when I dined as a guest of the restaurant recently at Bluestem Brasserie in downtown San Francisco. First, because my friend, the ever-talented photographer Craig Lee, who took the photos for my cookbook, “San Francisco Chef’s Table” (Lyons), not only agreed to be my dining companion that night, but also offered to take all the photos. 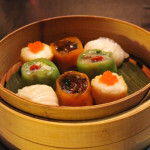 It was a rare opportunity for me to just enjoy the food without having to worry about lighting or shutter speed. And let’s face it, Craig’s photos will always be heads and shoulders above mine. Just take a look for yourself, as he took all the pics on this post. 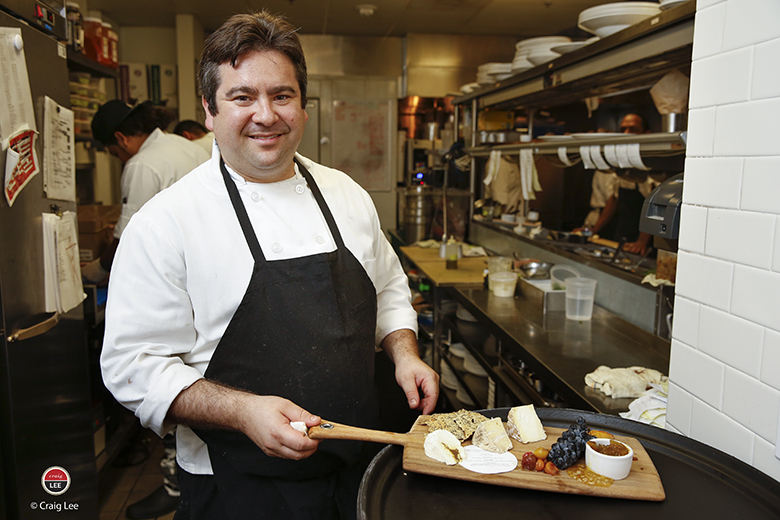 Second, because the equally gifted Executive Chef Jeff Banker was in the kitchen here. 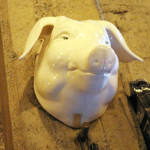 Banker and his wife Lori Baker owned the charming Baker & Banker in San Francisco until it closed last year. 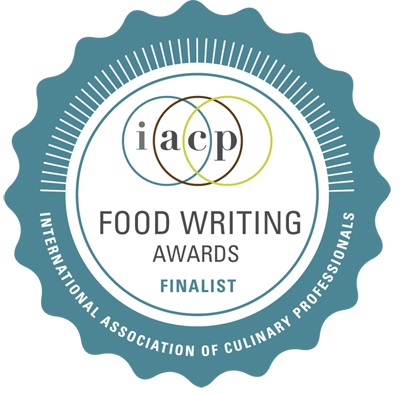 (In fact, his recipe for “Mirin-Soy Glazed Black Cod” and hers for “Roasted White Chocolate Cheesecake” are featured in my cookbook.) I still miss Lori’s decadent, mile-high cakes there. 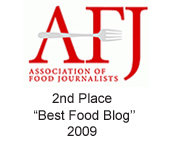 But at least now, I can enjoy a taste of Jeff’s food again. His arrival at Bluestem is a reunion of sorts, as he worked at Postrio in San Francisco with Bluestem Co-Owner Adam Jed, when the latter was the morning-shift manager who would open the place up at 3 a.m. The first floor of this urban-cool restaurant. 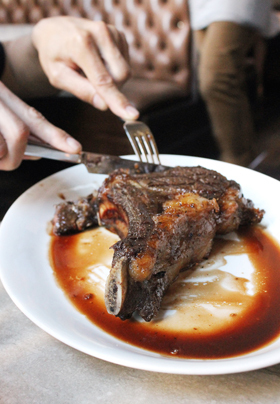 In the teeny kitchen at Baker & Banker, Jeff rarely got a day off. He had to be there all the time because his staff was so small. 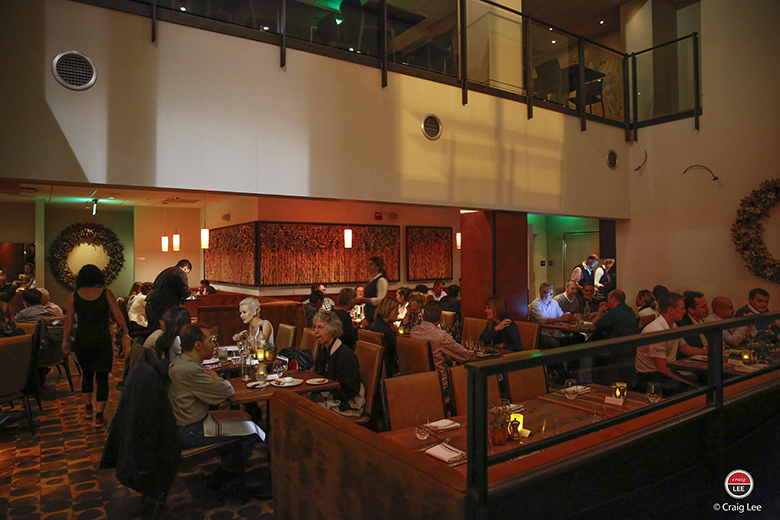 In contrast, at the 220-seat Bluestem, he has three sous chefs and two butchers on staff to take apart whole animals. 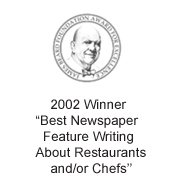 Good thing, too, because this restaurant, with its soaring ceiling, large glass windows and sleek urban vibe, gets hopping. It’s open 11 a.m. to 11 p.m. daily, and if a convention is in town, the bar-lounge area is sure to be the place where everyone congregates. Bluestem offers up a lot of options. There are half a dozen plates to share, including a selection of house-made charcuterie (made from all those whole animals they get delivered). 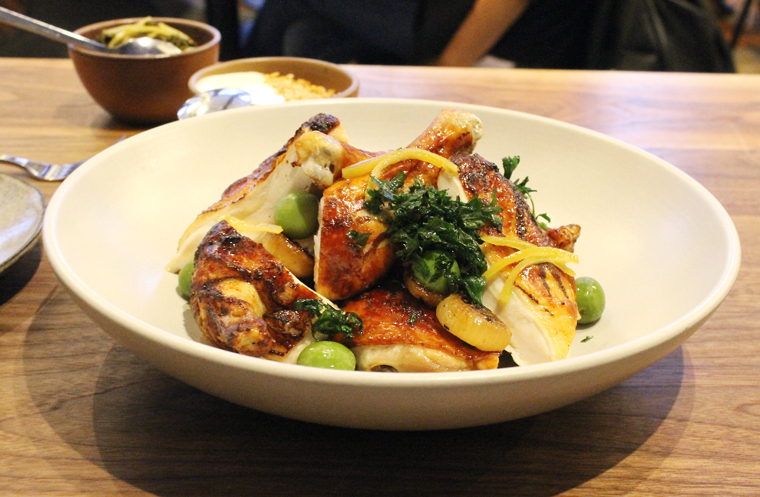 Monday through Friday, there’s also a “Plat du Jour,” such as Southern fried chicken with all the fixings ($28) on Monday or house-smoked beef brisket with baked beans, Texas toast and coleslaw ($32) on Wednesdays. Specialty cocktails ($12) include the fruity, herbacious yet not very sweet Ol’ Thyme Peach, a blend of lillet blanc, thyme tea syrup, fresh peach, lemon and mint. 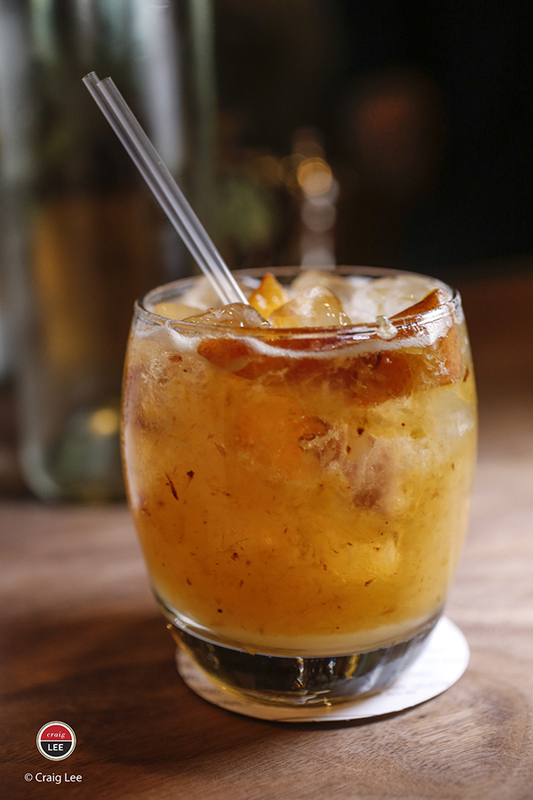 Jed says he has a regular who likes to add bourbon to his, and I can totally understand why since bourbon and peaches make magic together. 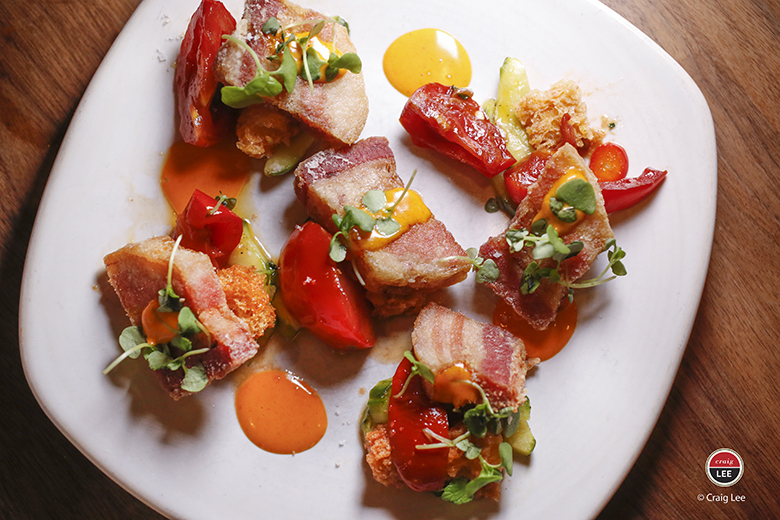 The “Crispy Pork Belly BLT” ($15) is almost like a refined porky panzanella. Brioche croutons are soaked in tomato water and strewn here and there on the plate with sweet-as-candy dry-farmed Early Girls, charred cucumber, and tender, juicy bacon-y chunks of pork belly. Espelette aioli gives it a playful hit of heat. 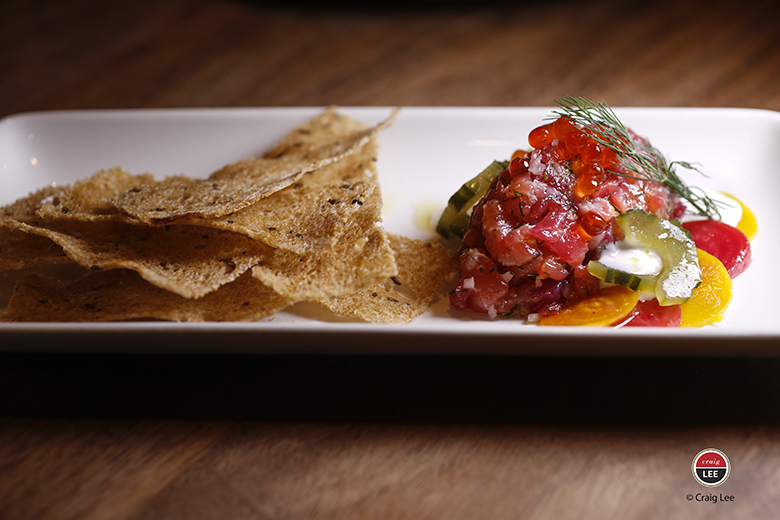 “Beet-Cured Salmon Tartare” ($16) is splendidly buttery in texture. 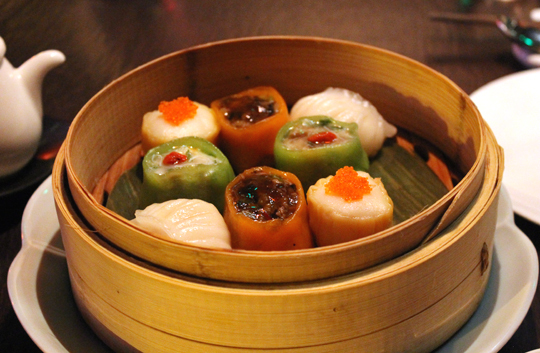 It’s served with compressed cucumbers, salmon roe and fresh dill. Spread a little on an accompanying rye crisp and take a bite of bliss. It’s rich, vibrant and just salty enough. Indeed, Banker has a way with seasoning. After a dish or two, you notice just how perfectly seasoned everything is — never too much or too little salt, but just enough to bring out all the flavors to their fullest. 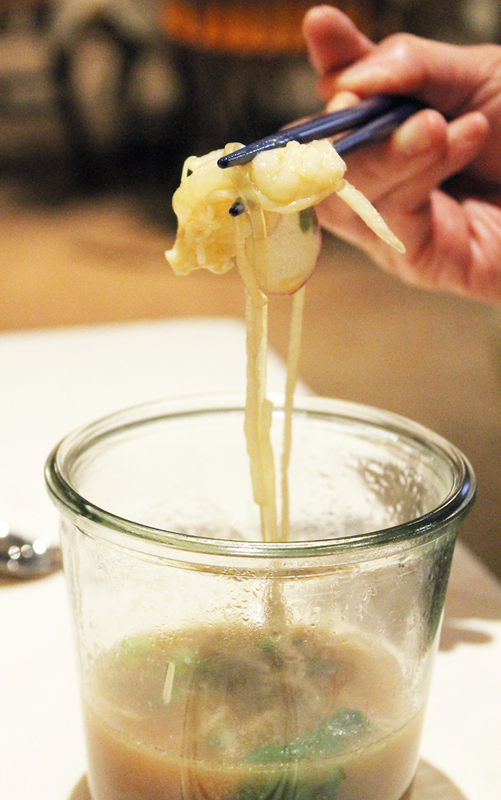 I wouldn’t have imagined octopus with melon ($15), but the two work wonders together. 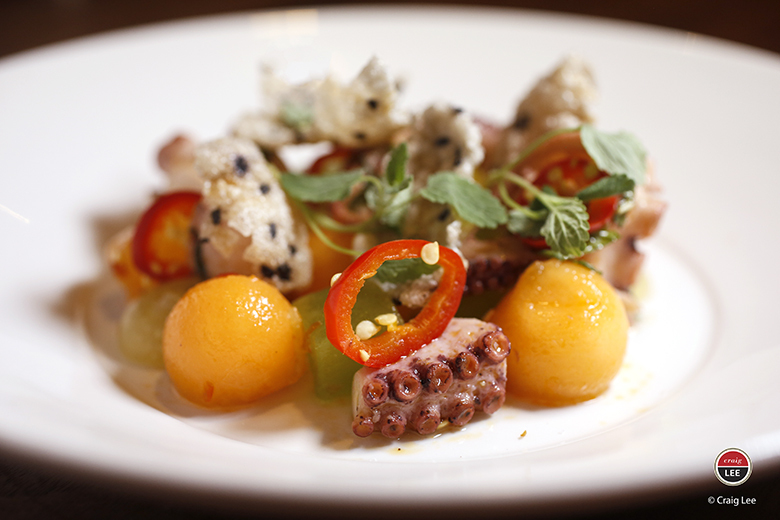 The Spanish octopus is tender and meaty, and dressed with a sambal-sesame vinaigrette for a Thai-influenced flavor. Compressed melon adds a quenching freshness and subtle sweetness to balance out the chili spice. 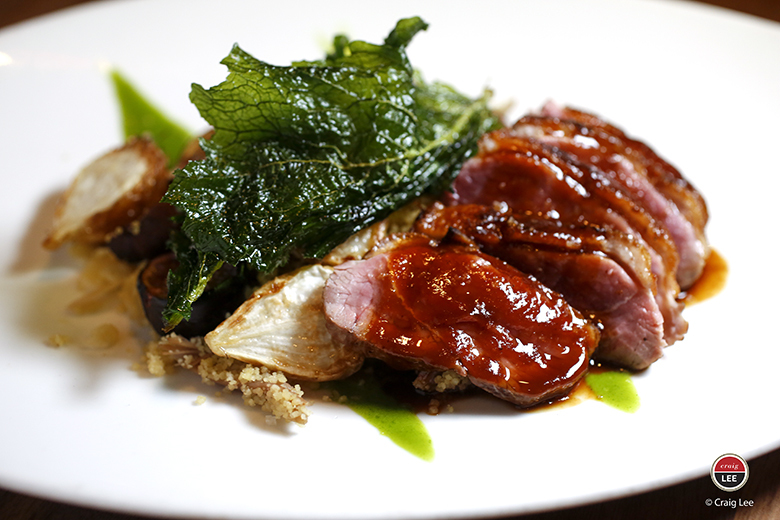 Liberty duck breast ($31) is one of the best preparations of this fowl that I’ve had in awhile. The sliced breast arrives beautifully plump, succulent and rosy — not too rare. Roasted figs are the perfect garnish, especially with the warm, earthy North African ras el hanout spice mix on the duck. 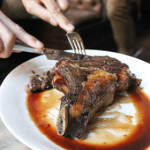 I can never resist any meat from BN Ranch when I see it on a menu. The ranch is owned by Bill Niman, who founded Niman Ranch and is famed for the care he takes in raising sustainable beef, lamb and turkey. 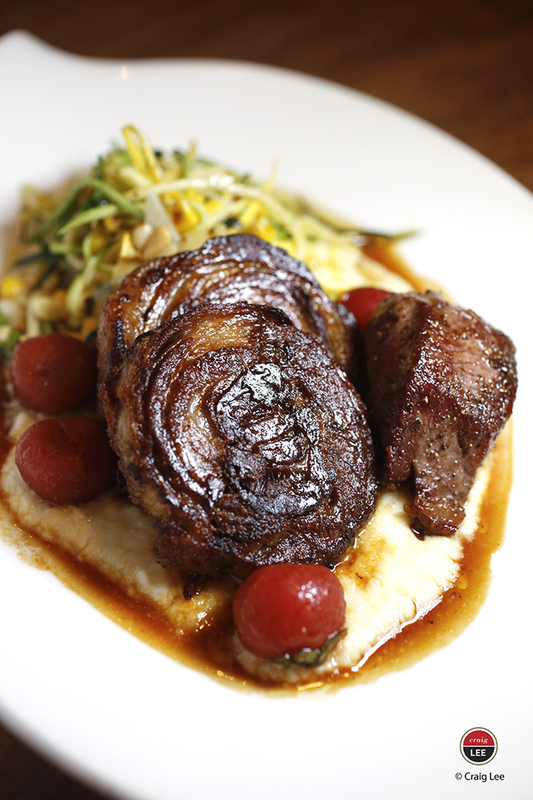 Bluestem features a BN Ranch lamb ($31), the cut of which varies depending upon the day. That night it was a duo: a loin that was super flavorful with the texture of fillet mignon, and a roulade with a wonderfully crispy exterior and luxuriant layer of fat that gave way to meat so tender that it was like long-cooked short ribs that just fell apart at the touch of a fork. Creamy Anson Mills polenta, marinated cherry tomatoes, and a corn and summer squash salad completed this comforting dish that was a taste of the changing seasons. Pastry Chef Curtis McDonald managed to turn an all-white dessert into a refined show-stopper. 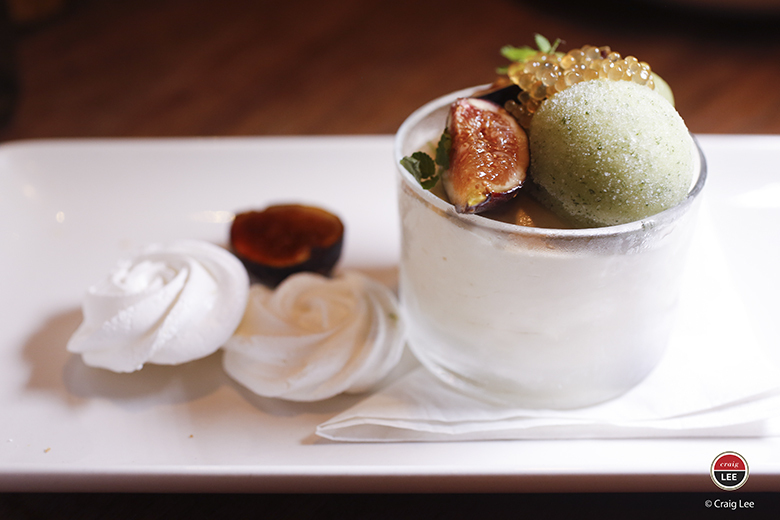 His “Honey I Bruleed The Fig” ($11) is a glass of honey & fig leaf semifreddo with tiny balls of melon, mint-melon sorbet, lime meringues, deep purple figs, and “caviar eggs” that squirt honey. It’s light tasting and so elegant you only wish you could serve it at your next dinner party. 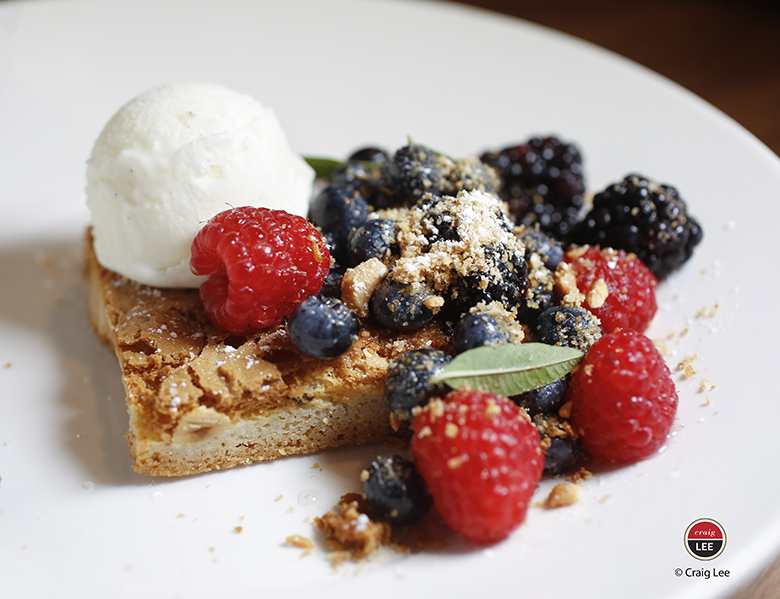 “Atomic Debbie Bar” ($11) is at the other end of the spectrum — a big kid’s concoction of a chewy butter blondie on a short bread crust piled with fresh berries, toasted nuts, tangy creme fraiche ice cream, micro leaves of lemon verbena and a sprinkle of lavender salt. If you love a good cookie with your ice cream, this one’s right up your alley. 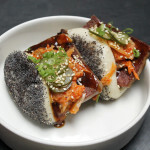 Jed explains that he likes being in the happy medium range of dining these days — not up there with the stratospheric tasting menus of late and not fast-casual where it’s all about getting them in and getting them out in flash, either. 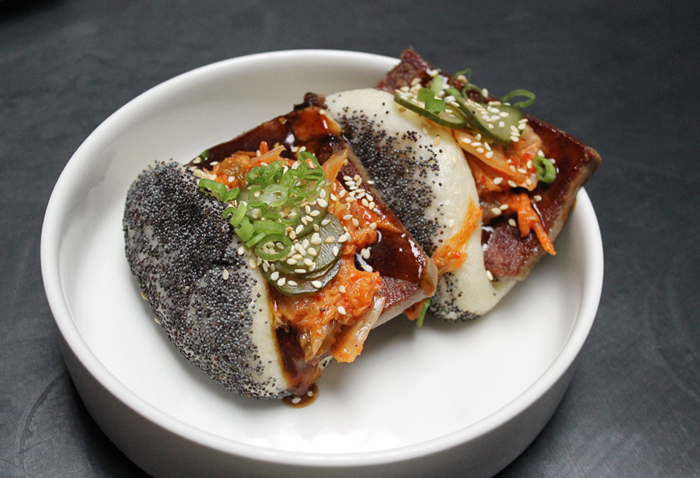 Instead, Bluestem offers a fun, satisfying, non-cookie-cutter taste of the big city that is sure to please. Maybe I should invite Craig to go to dinner with me too! The food looks so vibrant in these shots. 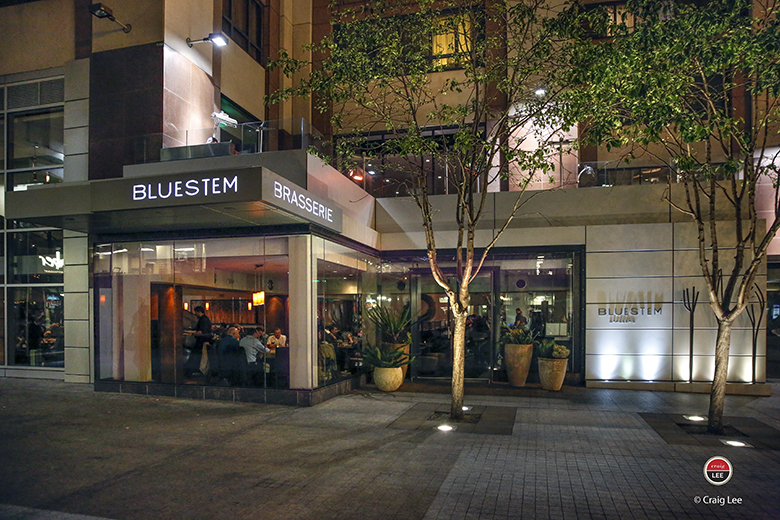 I have to say, I’ve always just walked passed Bluestem Brasserie in that little alley downtown because I just think it’s a big corporate place. But now with Banker as chef and in charge of the kitchen, I might have to check it out. That all-white dessert does look amazing! Ben: LOL I know what you mean. Aren’t Craig’s photos dazzling? I told him I should take him to every dinner I go to from now on! And actually, Bluestem is not corporate at all. Owned by a local husband-and-wife team who have long ties to the Bay Area. Co-owner Adam Jed is the consummate host, too — chatting up his guests and making them feel right at home. Glad to see them upping their game with Banker in the kitchem, and I had no idea about the Postrio connection.